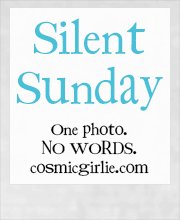 Another two weeks have whizzed by and I’ve put blogging on the back burner. For two reasons really, firstly I was really not well enough to type up blog posts, no matter how short and secondly I wasn’t really in the mood to over share what was going on at the time. I was very teary, in a dark place and needed to sort myself out before I could work out what I wanted to write. It’s been quite a hectic fortnight and I don’t think that has helped either, when there is lots going on I have no time to rest and this gives my brain very little time to function. Brain fog is still a huge issue these days and the fuzziness means I often need a quiet environment to just hear myself think. So what’s been going on, Andrew has been working super hard, he had a major installation in Gloucester only this week, this kept his away from home for two days. He took two “workmen” with him, one being our youngest son, so in turn his fiancé stayed with me as my replacement carer. I had some pretty invasive testing in the last fortnight at the Royal London it was regarding my colorectal area and I was back under the care of the Gastro Physiology Department, I can’t fault their care and the way they handled the delicate nature of these tests. The only problem was it left me feeling terrible so I didn’t have my NJ feed that night, I just couldn’t face anything I felt wiped out and nauseous, this I believe caused me the problems for the rest of the weekend. Because by the Saturday afternoon I realized I hadn’t used my NJ since Thursday night/Friday morning so it would definitely need flushing. I got a feeding set and some boiled water prepared, however, of course it wouldn’t work. I called Andrew and he came home immediately. He spent ages trying all the methods on the help cards that Abbotts provide you, push/pull, massaging the tube, I then decided I needed to call the helpline. They suggested heating the tube so we tried that, they also said carbonated water, Andrew headed off to the shops for a bottle of water. We tried again, lots of muck was coming away from inside the tube but it was stuck fast. The lady on the helpline admitted that if those things didn’t work the only thing would be A&E. As Andrew headed to work, I therefore went to the hospital. It took six hours and following a heated debate and a near miss admission, I returned home still with a blocked NJ tube. Sunday we went to the annual DJ trade show, BPM, I felt this would be one of the easiest things to do (not only to take my mind of the blocked tube) but it strangely wasn’t. For so many years people have seen me well and full of life, so finally see this broken woman, it left me bereft. It wasn’t until I saw one of my oldest friends that I actually broke down in his arms, he just let me sob. Admittedly I felt much better after that but the day had taken its toll! I felt awful and the blocked NJ was now causing severe pain, I was exhausted! By Monday I realized the community dietician could probably do very little, I did put a call into her though. By lunchtime I couldn’t wait any longer and Andrew took me back to the hospital, by the time we got there A&E was full up, we were told there were 150 people waiting! I didn’t care I was in agony. Eventually I was taken through, then admitted, this time it didn’t matter but it did because on Monday night we had tickets to see Chris Young, we had been waiting months! I was taken to the ward via X-ray and eventually settled in my bed. From midnight I would be nil by mouth, the next day I would be heading back to the procedure room to have the NJ removed. Tuesday lunchtime after a sleepless night I was taken down, after a panic attack in the GI Suite I was sedated and the tube was removed. That was the end of that! I’m relieved to be honest, I haven’t cried once since, I had cried every day since it had been placed. The only sad part is I gained over 2kgs whilst it was in and I managed to lose one kg already whilst it was blocked and waiting to get it out. So the plan at the moment is …… I’m due to see my specialist in three weeks and discuss my options then, I will not have another NJ, so it will be a case of having a PEJ fitted after then, we will have to see how my weight is doing. If I am managing to gain any weight orally then I will not need surgery, if I can not gain or even maintain my weight then I will have to go through the surgery. 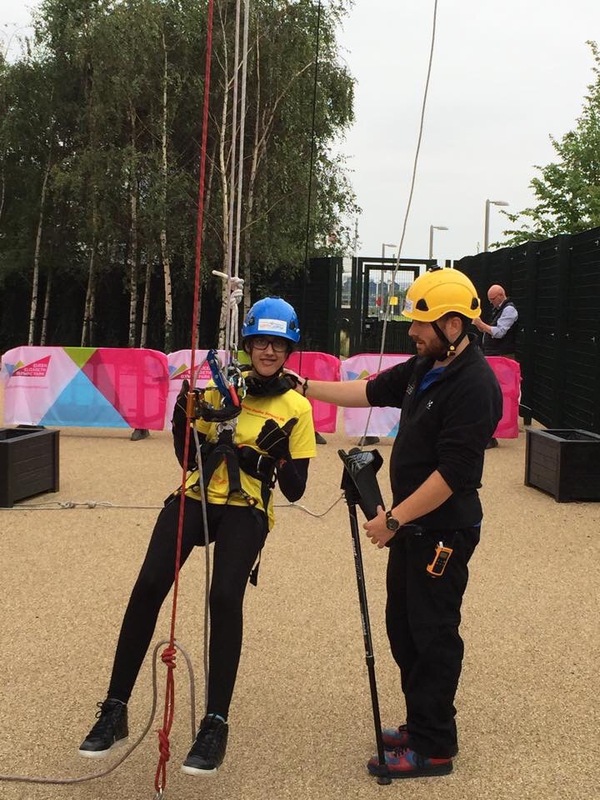 On the 30th August, the amazing Sonali completed her abseil in aid of Ehlers-Danlos UK. To say the whole community is proud of her is an understatement. I was sad I couldn’t be there in person to witness this amazing achievement!! 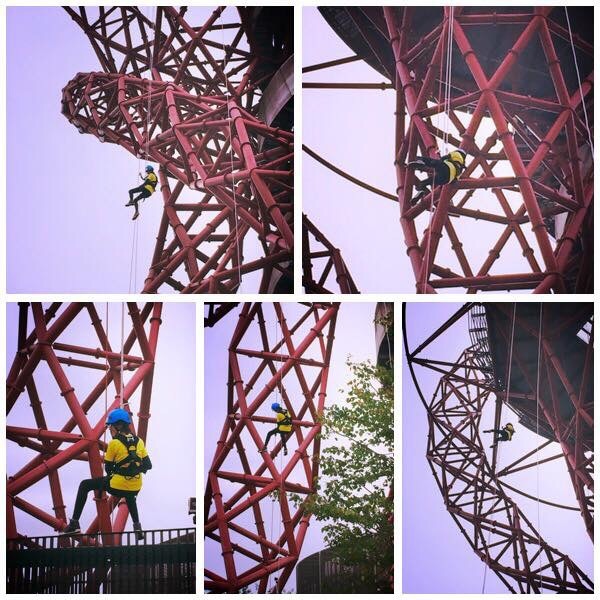 Here are the images of her coming down the Orbit! The weekend was due to be a wash out and with very little planned and my mood very low, this didn’t bode well. We had missed the whole tour of a visiting US artiste and when our friend Pete popped into the shop on Saturday with some of her goodies, it really hit home how much this bout of illness had taken some fun stuff away from both of our lives. Andrew went to work as normal Saturday night and as his was a very late night I went to be really early as I was not feeling at all well. When we woke up the next day, Andrew asked how I was doing, he got me some breakfast in bed, well tea and toast but it was the thought that counted! Then we started working out what could we do for the next couple of days, we were meant to be going to a “festival” type event but with the rain there was no way my wheelchair would withstand a field. So did we fancy two days just chilling at home, or was I up to a little adventure? I had a hunt for a hotel, up north and within fifteen minutes it was booked. We decided not to tell anyone, we didn’t take to social media, we would turn up and surprise everyone. After all the last person they would expect to see would be me, and tonight was the last night of the tour, so it would be even more special. We headed off to the motorway and stopped at the services first, Andrew asked if I wanted anything to eat, cake!! I wanted cake, so I had my first treat a slice of Patisserie Valerie, Black Forest Gateau my absolute favourite. Forget anything savoury that was what I wanted for my lunch and as I wasn’t watching calories I was allowed whatever I wanted, so as we headed up the M40 I munched on my cake, oh that and the bag of Percy Pigs. After three hours we got to our hotel and after checking in changing, we were soon heading off to the venue. 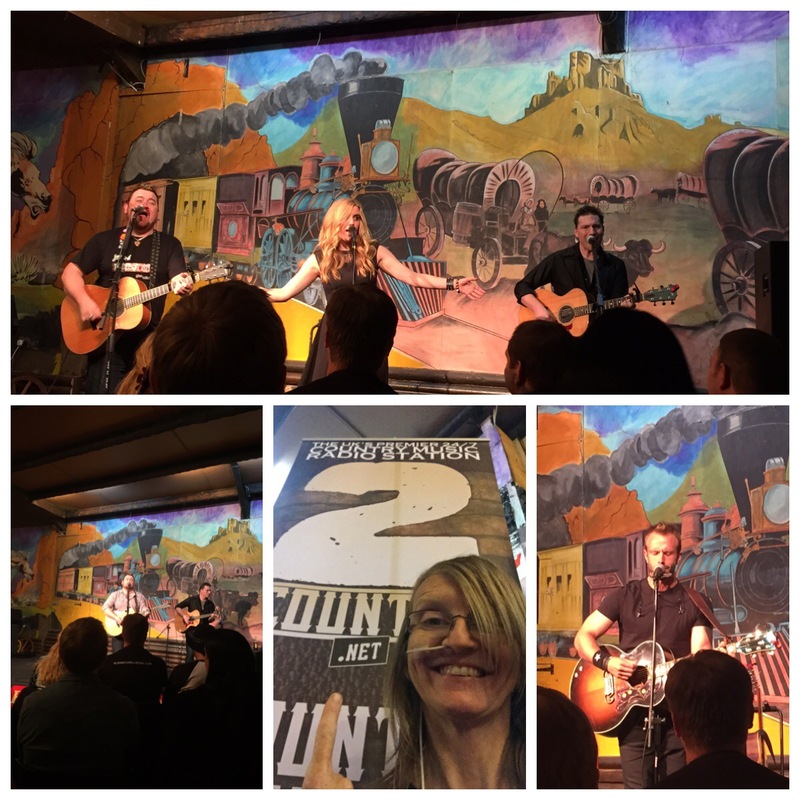 Fort San Antone is a country music venue which holds regular live music nights, this was my first time and I will say it won’t be my last. It was amazing, the owner Wayne gave me such a warm welcome which was lovely, he is obviously very proud of his establishment. Soon we were meeting our friends and the hugs and kisses were so worth the long drive, this is why I love my country music family they are just awesome. It isn’t just about the music they all genuinely care about me and my health, they were all pleased to see me, none of them could believe we had travelled and were thrilled to see us. The night was fantastic, the music amazing, I loved every single minute, it took every ounce of energy but I wouldn’t have not done it and yes they did have me on the stage for the end of show, end of tour photo. It all got too much and Andrew could tell, he called it a night and loaded me into the car and drove me back to our hotel, we headed to bed I needed a decent night sleep ready for part two of our adventure. We didn’t wake up too late and headed off to breakfast, Andrew enjoyed a nice hot meal, while I had a bowl of cereal. I wasn’t going to set my feed going until later that day so needed something to just keep me going. 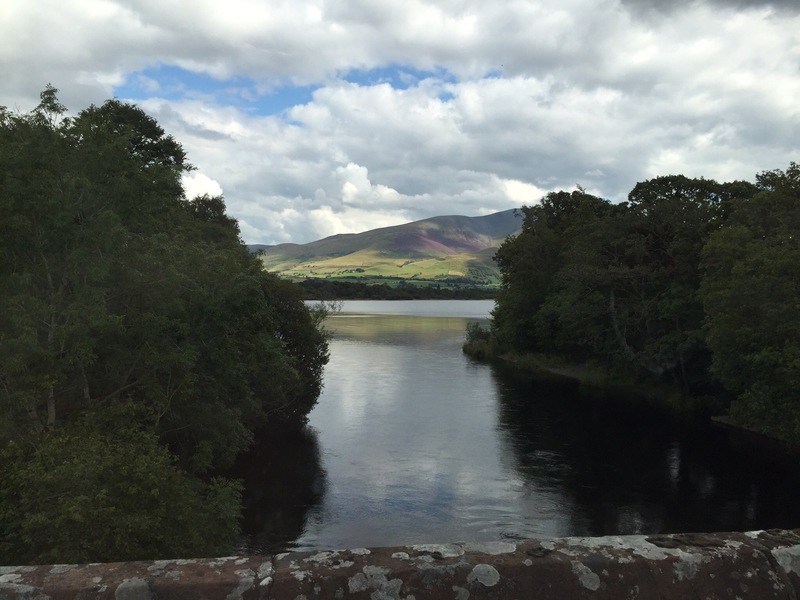 After a shower and checking out, we hit the road and headed north, we were going into the Lake District. Neither of us have been to the Lakes and after this weekend we are both scratching our heads as to why we haven’t? As we left the motorway and the mountains, lakes and gorgeous scenery opened up it just became more and more breathtaking. 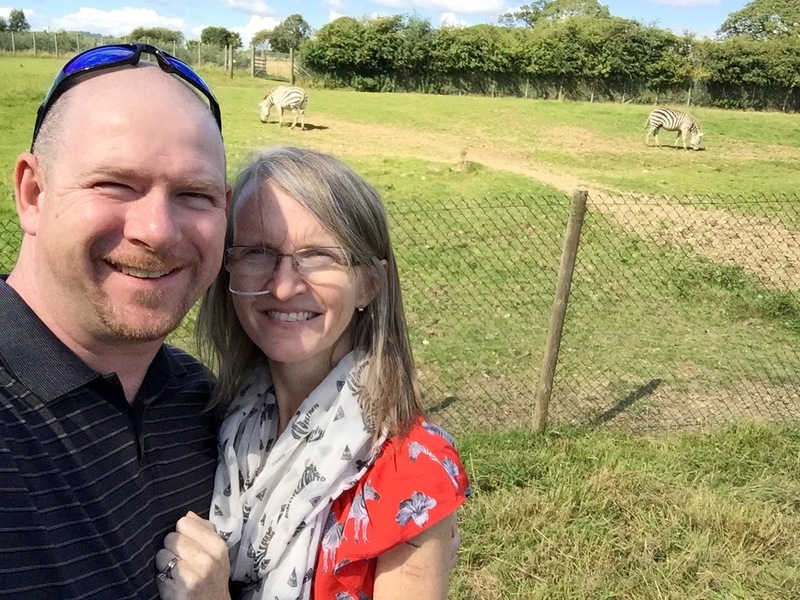 At christmas Katie gave me a Zebra, well gave me, she adopted me a Zebra for a year from a wildlife park in the Lake District and you are allowed to turn up at the park and show your certificate and say “I own a Zebra let me in” Which is exactly what I did. It was great fun and it worked. 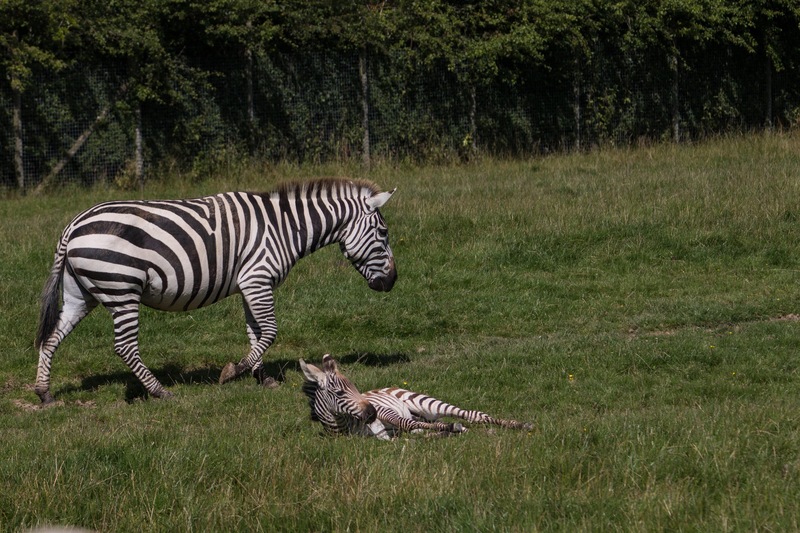 It was a lovely little park and yes I saw my zebra, not only that but they had a brand new three week old zebra!! After nearly an hour gazing at the stripy creatures we headed back down to the main park. We had tea and cake before leaving, I just set up my feed as I left. We then started heading south through Keswick past all the lakes the scenery was amazing, we would occasionally pull over to take pictures, or get a drink, or ice-cream. Once on the motorways the drive became much more arduous, the rain set in, it was the first time we had seen rain all weekend. Then the traffic started to snarl up, so we left the motorway at one point so Andrew could get a proper meal. We rejoined and then decided to just head home, we made it home 9 hours after we left the Wildlife Park. What a journey but what a weekend.